What do you think about setting poetry to music? (As opposed to writing song lyrics, I suppose). Personally I rather baulk at the thought of something I’d written being given a tune. I worry that adding music doesn’t just create another layer to complement the words, but it has the capacity to alter them permanently, like putting a painting in a particular frame, it can get in the way of the personal response of the viewer/listener/reader. Nevertheless in the hands of a skilful composer you could say music takes the words to another, higher level. I can think of a couple of choral pieces where the combination is glorious – The Lamb, John Tavener’s setting of William Blake’s poem for starters, and Stanford’s The Blue Bird, words by Mary Coleridge. 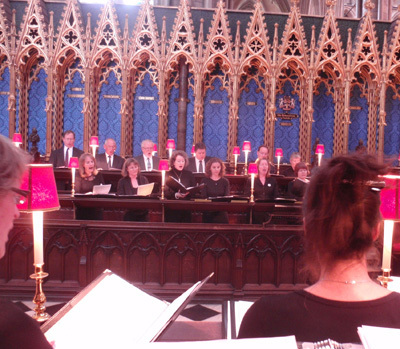 Yesterday I was in an all-day rehearsal with our choir, the Lewes Singers. We’re singing the services at Westminster Abbey next weekend. (Do come and hear us if you’re in London – all the times and details of what’s we’re singing are here.) I confess I’m not a church-goer, but Evensong is the most wonderful invention of the Anglican church. If you’ve never been to an Evensong in a British cathedral, please go some time if you can. It’s short, it follows the exact same format it has done for centuries, and there’s very little for the congregation to do but listen. History, tradition, beautiful music – a meditative experience. One of my favourite parts of the service is the chanting of the Psalms. For a singer, psalms are one of the hardest things to get the hang of. You have to fit the words to the notes of the chant, observe the pauses and move to the next note precisely at the same time as one another. It’s intense and you can’t let your concentration slip. And the words of the Psalms are unpredictable – full of the earthy violence and passions of the Old Testament, sometimes very funny, always vivid. Sadly, it’s too easy for the psalms to sound rough around the edges, and there are some very boring chants. But done well, they are the most powerful thing you’ll ever encounter in a CofE service. Thankfully in the Lewes Singers we have Nick (my husband, and the conductor) to write us our own chants. Lucky us! OK so I’m showing off a bit here. But listen to this and tell me it’s not exciting. Have a wonderful weekend at Westminster – it sounds fabulous. I have one particular poem of mine, about St Cecilia, that I keep meaning to set to music. I deliberately kept the form simple, like a song, so one day I’ll arrange it for a choir. I think it’s fascinating singing beautiful poetry: John Adams set three Emily Dickinson’s poems in his huge orchestral & choral work ‘Harmonium’. Have you sung it? Brilliant stuff. Hi Robin…I just downloaded a poem by Andrea Gibson after signing up for her fanpage and it’s a poem sett to music…totally lush, didn’t think I’d like the music element, but actually I do! Obv as long as the music is right for the poem! *Set not Sett! Isnt Sett to do with Badgers?? Damn, rambling now!